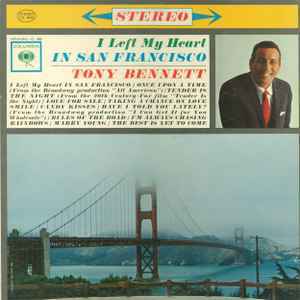 I Left My Heart in San Francisco is a studio album by Tony Bennett, released on Columbia Records. It peaked at #5 on the Billboard pop albums chart, and has been certified platinum by the RIAA. It is one of the best-selling albums of Bennett's career. In February 1962, the song "I Left My Heart in San Francisco" was released by Columbia as the b-side to "Once Upon A Time," but became a chart hit in its own right. Columbia assembled the album around the single, including material that had been previously released on singles and unused items from earlier sessions. Ralph Sharon — piano; arrangements on "Love for Sale"
The Count Basie Orchestra — instruments and arrangements on "Taking A Chance on Love"
Marty Manning — arrangements on "San Francisco," "Once Upon A Time," "Tender is the Night," "Candy Kisses," and "Have I Told You Lately?" Cy Coleman — arrangements on "Marry Young" and "The Best Is Yet to Come"
Ralph Burns — arrangements on "Smile" and "Rules of the Road"
Frank De Vol — arrangements on "I'm Always Chasing Rainbows"
Candido Camero, Sabu Martinez, and Billy Exiner — percussion on "Love for Sale"
This is a very good album to play when having dinner or just drinks with company over, or just being alone. A very relaxing album to play with the title track " I Left My Heart In San Francisco" Tony Bennetts signature song. The picture on the album is moody of the Golden Gate Bridge amongst the San Francisco mist is sublime.